We made our second trip to the grocery store Friday night—yes grocery shopping on a Friday night, we know how to live it up at my house!—and did pretty well with our zero waste challenge. Since our first shop two weeks ago we have done some research on a number of things. First, since the stickers our co-op provides for use in the bulk foods aisle to mark your container weight and the item’s price lookup number (PLU) are not recyclable, we went to the hardware store and got ourselves a couple of china markers (also known as grease pencils). These are made of hard wax and wrapped in paper. They can write on glass, metal and plastic, and you can wash the marks off with a little soap and water. Works great on our own glass containers. 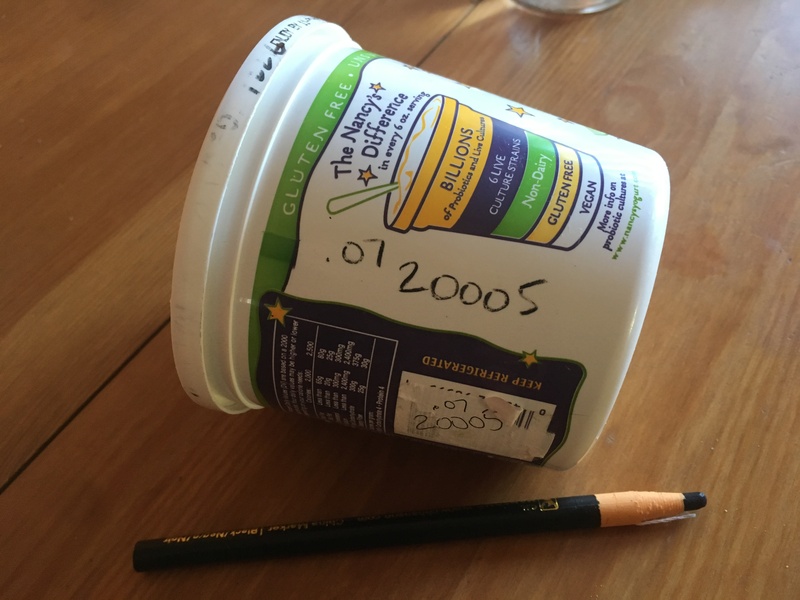 We tend to reuse containers from pre-packaged food though, like the big yogurt tubs we buy. These of course are printed all over with product information and don’t lend themselves to easily being written over. But we managed! I’ve also been researching cat litter. We have found Okocat. It comes in a cardboard box. The litter is made of reclaimed wood, is dust free, clumping, flushable, biodegradable, and allegedly lasts longer than clay cat litter. Our co-op does not sell this litter but one of the big pet box stores not far from us does. Target also has it, but not in the store. We bought a box today to try out. Hopefully Waldo and Dickens like it. I’ll let you know! We were feeling pretty awesome about ourselves while shopping, but unfortunately somehow didn’t manage to bring enough containers with us and had to avail ourselves of two plastic bags on the bulk aisle. But, we will reuse the bags, and we can recycle them. Still, it was a bit of a fail there. This time around, we only had two things we had to change our purchase on. The tempeh we buy comes in vacuum sealed plastic. However, there is another brand, made locally and wrapped in paper, we bought instead. It is a couple dollars more, but we do get slightly more for the cost. Ounce to ounce though the local paper wrapped tempeh is more expensive. But since we are saving money on other things I guess we at least come out even. Plus, we are supporting a local company instead of a big corporation. We also needed to buy some pasta. The brand we usually buy comes in plastic. Our co-op sells some varieties of pasta in bulk and we were going to avail ourselves of that option when we noticed a new brand of pasta that was on sale. It is made from red lentils and comes in a box. So we decided to give it a try. It might appear on a Meatless Monday post sometime. You never know. I am currently having a think about the yogurt I like to buy. As I mentioned, we reuse the containers in the bulk aisle, they are a perfect size! An unsweetened soy yogurt tub lasts me a week. The problem is, for food safety reasons, there is a plastic peel-away film on it beneath the lid. I can reuse and recycle the container but not the plastic film. What to do? I bought a yogurt maker last year and have tried a number of times to make my own yogurt and have not had any success. The yogurt maker doesn’t have a temperature setting and I think it doesn’t keep it at the right temperature. I guess that’s what I get for buying one that only cost $25. I might have a solution. I recently found a recipe for oat yogurt. No probiotics need to be added, and it just needs to be kept mildly warm while it sets up. It is not a milk yogurt at all, it is basically fermented oat flour. I am making it this weekend and will let you know how it turns out. If it is a success, then no more plastic soy yogurt containers will be bought. Not quite zero waste, but we are making progress. Good for you for making such an effort. Okocat seems a great find. I am now fascinated that you have been attempted to make your own yogurt. I may give it a try. I like to be frugal but I will remember that yogurt makers should have thermostats. I am hoping the cats don’t freak out over the new litter. We are doing a gradual introduction so the get used to it. You can make yogurt without a yogurt maker, you just have to keep it warm enough while it sets. A yogurt maker seemed so much more efficient than keeping my oven warm for hours. I set the oat flour out to ferment yesterday. Fingers crossed on the results! Your efforts are admirable! Very curious about the oat yogurt so keep us posted on how it turns out! Thanks Iliana! I have the oat flour fermenting (I hope), and will know in about a day. I am so inspired by your efforts! Yogurt maker that too oats yogurt! I am snowed! You rock Stefanie! Keep it up and keep inspiring us! I think you are doing so well. Very inspirational. awesome progress! I am going to check out the litter; we recycle the box our litter comes in but if Thomas would go for a wood litter that would be nice. I used to use a wood-dust litter but it was SO MESSY. Will be interested how your cats like it. I am currently having a yogurt conundrum as well. Our recycler doesn’t take tub containers anymore (SO BUMMED) so we are trying to find alternatives. I made yogurt a few times and it was fine but not great, and I find that I do re-use most of the containers for various things (sending leftovers home with friends, etc. ), but still. I wish there was bulk yogurt at the co-op! Thanks Daphne! Yeah, Okocat is wood pellets so it shouldn’t be dusty and no perfume either. Oh wouldn’t bulk yogurt be interesting? I suppose that would be only possible at a dairy or something and not for plant-based. We put too much water in our first oat flour yogurt attempt and now have to start over. At least we only tried to make a small batch. Let me know how it goes! I am definitely happier with less dairy (although cultured dairy is generally OK) and I would love to not have all these containers. Will do! I’d like to cut back all of my yogurt tubs too. We used to use Feline Pine (pine pellets) cat litter back when we had a million cats. Then my brother-in-law told me that you can buy the exact same product (different brands) at most farm stores in 35 or 40 pound bags for a fraction of the cost of Feline Pine. I don’t know how the math works out, but there’s just one big plastic bag as opposed to several smaller plastic bags. I don’t think the pellets are from reclaimed wood, but they’re a by-product of something. Joan, we buy pine shavings for the chicken coop and it is definitely cheaper than pine for cat litter. I seriously thought about trying it for the cats but it is really dusty so I decided it would be a bad idea. The cats have a couple litter boxes and we changed one to the Okocat yesterday so we will see how it goes. The Feline Pine product and the one we used to buy at the farm supply store are pine pellets, not shavings. They don’t get tracked all over the house like clay litter does and it also neutralizes the smell of urine. I wouldn’t use shavings either, but the pellets aren’t dusty. You still have the big plastic bag to contend with, though. Ah, got it. Yeah, there would still be that plastic bag. Looking forward to your experiences with the oat yoghurt. If it is good I might give it a try, that is if I can get gluten free oat flour. We had a tiny success too. Finally found unbleached folded tea bags (thus without plastic), without a metal staple, and in a bio degradable box. Cath, we are trying a new small batch because we added too much water to the first one and got slush. We made our own oat flour by running raw oats through the blender. That is a great success you had! It is really hard to find tea bags that don’t have a metal staple in them. I am stocked up on tea at the moment so hadn’t thought about it, but when I made some mint tea yesterday I saw it h ad a metal staple. I might have to finally get around to buying a tea ball and using loose leaf tea. It’s very cool and inspiring that you are really trying to go zero waste. Maybe the more people who try this and ask for products to buy your local coop will try and provide more choices for you! I wondered if you had tried to make your own yogurt. what do you use? Is it tofu based (sorry for my ignorance here–I know you can get yogurt made out of soy or coconut, but I am not sure how easy it is to make? Then again if it is all natural, maybe it is much easier? Your meatless Monday meals look yummy by the way! Glad to see you posting again! Thanks Danielle! We have tried making yogurt with soymilk (which we also make) and have not had success because I think the yogurt maker we got doesn’t keep it at the right temperature. You can also use coconut milk but we haven’t tried it because we didn’t think we would have success with it in the yogurt maker. It’s an easy process, you heat the milk up to a certain temperature on the stove (we use a candy thermometer), add your thickener, let if cool to a certain temperature, add your probiotics, and then it needs to be kept warm for about 8 hours. Lots of people use an oven but we thought a yogurt maker would be more efficient than heating up our whole oven. Nope. The oat yogurt is fermented oat flour, so a little different process. Glad you are enjoying Meatless Mondays!